D.B. Jackson is the pen-name of David B. Coe. 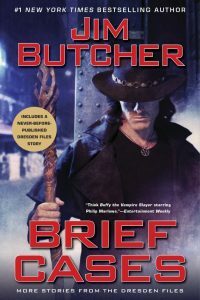 The author has written several novels under each name, though I confess I’ve only a read a couple of those – Thieftaker and Thieves’ Quarry, set in an alternate version of historical 18th-century Boston with magic. 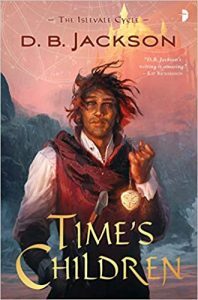 Time’s Children is the start of a new series, the Islevale Cycle, whose premise combines epic fantasy with time travel. In the world of Time’s Children, Walkers can travel back (and then forward again) in time, but only at a cost: the time they travel is added to their lives, so if a 40-year-old person travels back in time ten years, they will arrive as the physiologi­cal equivalent of a 50-year-old – and if they then travel forward again to the point at which they started, they will return as a 60-year-old. Rules govern what use may be made of Walkers, for their own protection, but in the face of political expediency, it seems rules are made to be broken. Fifteen-year-old Walker Tobias Doljean has been training at the Windhome Academy for most of his life. When he’s called to Daerjen to serve in the sovereign’s court, he sees it as the opportunity of a lifetime, the culmination of his ambitions: he’ll be valued, honoured, and richly rewarded (or so, at least, he believes). 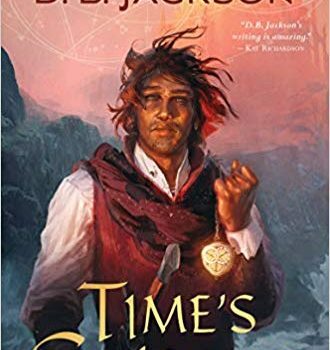 But when he arrives at Daerjen, he learns that the sovereign wants him to travel back in time a full 14 years, in order to prevent a war that is ruining the kingdom. The Walk will cost Tobias years of his life, but he’s convinced it’s worth it. Unfortunately, there’s a spy in the court of Daerjen, and their enemies have Walkers, too, and when Tobias Walks back into the past, his arrival is shortly followed by the assassination of the younger sovereign he’s come to warn – the sovereign, and his entire family with the exception of his infant daughter. Tobias – a boy in a man’s body – is left trying to keep infant princess Sofia alive while on the run from people who want to kill them both. Meanwhile, back in the future that Tobias left, everything has changed. His once-girlfriend, Mara, is not a Walker – at least, so she thinks. But her sense of time is strong enough that she feels a pervasive background wrongness. 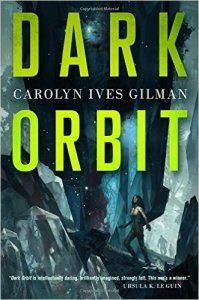 When a time-demon of the kind known as Tirribin – a time-demon who used to be Tobias’s friend – tells her that time has been changed, that it’s signifi­cantly out of kilter with what it ought to be, Mara discovers hidden gifts within herself. In addition to her other talents, she’s a Walker, too. This discovery, amongst other circumstances, spurs her to take the dangerous leap of walking back into the past to help a boy that this version of her has never met, and to try to thwart the totalitarian designs of the militaristic state that now controls most of the known world. Both Tobias and Mara are hunted. When Mara finally catches up with Tobias – partly by luck, partly by reason, and partly through the ability to make very useful friends – they will be hunted together. They have to deal with Tobias remem­bering Mara and his friendship with her, while to Mara, Tobias is a stranger. Not to mention being hunted, being essentially children in adult bod­ies, and having an infant to care for and protect. The protagonists’ ages makes Time’s Children feel like a YA novel – they’re so damn young and certain, until they run up against the world’s complexities and cruelties and find they don’t know as much as they thought they did. Time’s Children also has a definite coming-of-age quality. But if it’s intended as YA, it’s something of a dark one: Tobias is captured and brutally tortured, and it seems inevitable (based on the first chapter) that he’s doomed to age towards and past physiological middle age rather more rapidly than most people grow up into their twenties. The inevitability of early death follows him and Mara both, even if they’re successful in their quest to save the infant princess and eventually restore the timeline. Their primary antagonist is a brutally professional assassin, who has very few qualms about mass-murder (and who blames Tobias for the mission-related aging of his Walker wife). Jackson has a deft touch with characterisation. The two young protagonists are very relatable and recognisably young adults. Even their main antagonist, the assassin, feels like a well-rounded professional. In worldbuilding terms, the world of Time’s Children, absent its time-travel elements, seems very similar to a number of other fantasies, with its scattered, warring island kingdoms, its one academy for the teaching of magically gifted individuals, and its limited approaches to religion – but sometimes the classic approach does work really well, especially since Jackson’s world also includes gunpowder. From my point of view, though, it’s unfortunate that this world appears to have no visible queer people at all, not even a mention. It’s all the more notable since the majority of my SFF reading these days makes at least a nod in the direction of acknowledging the existence of people like me. On the whole, Time’s Children is a compel­ling novel, enjoyable and fun. I’ll be looking out for the sequel.